This edition applies to IBM® Spectrum Accelerate V11.5.4. IBM Spectrum Accelerate™, a member of IBM Spectrum Storage™, is an agile, software-defined storage solution for enterprise and cloud that builds on the customer-proven and mature IBM XIV® storage software. The key characteristic of Spectrum Accelerate is that it can be easily deployed and run on purpose-built or existing hardware that is chosen by the customer. IBM Spectrum Accelerate enables rapid deployment of high-performance and scalable block data storage infrastructure over commodity hardware on-premises or off-premises. 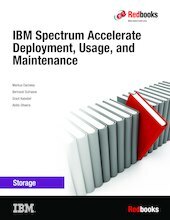 This IBM Redbooks® publication provides a broad understanding of IBM Spectrum Accelerate. The book introduces Spectrum Accelerate and describes planning and preparation that are essential for a successful deployment of the solution. The deployment is described through a step-by-step approach, by using a graphical user interface (GUI) based method or a simple command-line interface (CLI) based procedure. Chapters in this book describe the logical configuration of the system, host support and business continuity functions, and migration. Although it makes many references to the XIV storage software, the book also emphasizes where IBM Spectrum Accelerate differs from XIV. Finally, a substantial portion of the book is dedicated to maintenance and troubleshooting to provide detailed guidance for the customer support personnel.